Access to food, water, and basic shelter continues to deteriorate for refugees from Mali in makeshift camps in a desert region of Burkina Faso. Malian refugees fleeing conflict have come to find refuge in northern Burkina Faso, mainly in the provinces of Soum and Oudalan. Paris/Ouagadougou, April 24, 2012—Access to food, water, and basic shelter continues to deteriorate for refugees from Mali in makeshift camps in a desert region of Burkina Faso, said the international medical humanitarian organization Doctors Without Borders/Médecins Sans Frontières (MSF) on Monday. More than a quarter million people have fled to Mali’s interior and neighboring countries since fighting erupted between Tuareg rebels and the Malian army earlier this year. Since mid January, 46,000 Malians have taken refuge in Burkina Faso, with the vast majority in Oudalan province in the north, a desert area where humanitarian aid is very limited. MSF teams are providing emergency medical aid in the refugee camps, where needs outstrip resources. In Burkina Faso, the country with the second-largest number of refugees after Mauritania, refugees have been living in makeshift shelters in particularly precarious conditions for weeks. They have only a few pounds of food items and must wait endlessly under a brutal sun for a few liters of water. "We left everything when we fled our country," said Fatima, a refugee in the Ferrerio camp. "I am with my children. We have nothing. We're living in the open here." Nearly three months after the clashes began and despite the massive inflow of people, food aid is still extremely limited. MSF is providing free care to the refugees and to the local population, in a region already reeling from the effects of drought. "The World Food Program was slow to respond and the aid it is providing is neither sufficient nor appropriate to the refugees' dietary practices," said Jean Hereu, MSF head of mission in Burkina Faso. "This is putting Burkina Faso's hospitality to a severe test. The area where the refugees have settled has been hard hit by the lack of rainfall, which affects the cereal harvest and has a direct impact on household food security." The refugees have settled in four camps in the north of Deou district, in the province of Oudalan. But the UN High Commissioner for Refugees plans to group the refugees together on a new site that is unsuitable and where there are no water points or shade. After making food and water distributions in Mentao, in the province of Soum, the first camp to be formalized in early February, MSF started working in the province of Oudalan in early March. The MSF teams are providing support to the Gandafaou health post and send mobile clinics to the Ferrerio camp. The staff has held more than 1,600 medical visits in four weeks, treating respiratory infections, dermatoses, and gastric illnesses, which are characteristic of a lack of hygiene and access to water. MSF will also work in the Dibissi and Ngatourou-nienie camps, and is assessing the situation regularly to adjust its medical response to the populations' needs. MSF is also offering aid to Malian refugees in Mauritania and Niger. 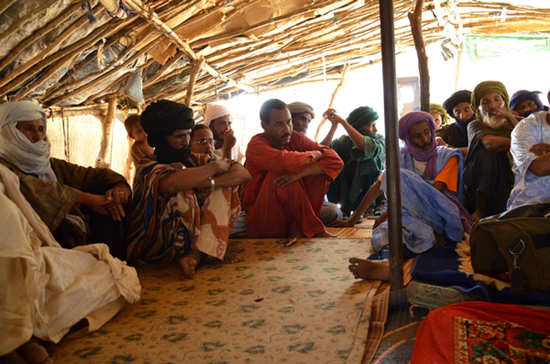 The organization is working in northern Mali (Timbuktu, Gao, Kidal, and Mopti), where the teams provide primary medical care to populations displaced by fighting.